Here is the roughed in armature for the figure. 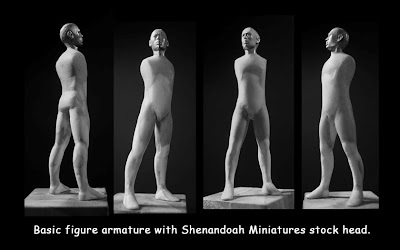 If you want to see the step by step process for putting an armature together look at my vBench on Planet Figure. Before "fleshing" the armature out I take a few left over pieces of putty that has cured and I cut and or sand them into a small square (chest/torso) and a small triangle (pelvis). I connect the torso with copper wire and then take brass wire and run it out from the area of the hip sockets and form the legs. Proportions are very very important at this stage and they could make or break your figure. There is very little to nothing that the best sculpting can do to hide an ill proportioned figure. After you're satisfied that everything is measured correctly you can then go about posing the figure. Though this figure may look somewhat stiff there are ways to add movement and drama to a somewhat static pose. Is there a reason for proportions of the flesh and muscles as a base? I tend to keep my figures more skinny most of the time. Depends on the figure subject of course. Robert, I do this to make sure the figure is properly proportioned. I like to keep my figures skinny also. I often will trim down the roughed in figure so it does not look heavy once I start adding clothing. Hi there Gary, long time no see. It's great to see you sculpting again, always love seeing your work. Leigh, Good to see you out and about. Hopefully we'll see something NEW from you in the near future. Gary, It's been a couple of years since I have touched a figure. Time really flies, all the old stuff has been trashed and I have started again with a new outlook, I will try to shoot you a pic over the weekend. By the way the trapper's stance looks perfectly natural to me, I'm eager to see your updates. TRASHED! say it isn't so. Those were really nice figures. Well, it's important to be satisfied with what you're doing.